There are so many wonderful museums to explore all around the world that it would take a lifetime to visit them all—but it only takes a few minutes to visit one online. Many of the top science museums reach out to long-distance fans through their Instagram accounts, which are playgrounds of knowledge and wonder. Here are seven of our favorites. This #FossilFriday had quite the surprising noggin! Triceratops' horn and frill look heavy, and its skull is about eight feet long—almost a third of its body length—yet it was much lighter than it looks. And its brain, which was smaller than that of a German shepherd, certainly didn't weight it down. New York City's American Museum of Natural History is one of those places you could spend weeks exploring and still not see everything they have to offer. That’s why you should follow their Instagram feed, which is like an online museum that rotates through different subjects every day. The feed features theme days like Trilobite Tuesday and Fossil Friday, with plenty of information to go with each image. #lilstrandbeest is excited to meet @therealadamsavage's beest! The Exploratorium in San Francisco is more than just a science museum—it’s a hands-on learning experience for people all ages. But if you can’t make it to the West Coast, many of the museum's experiences are shared in video form on the Exploratorium’s Instagram feed, including footage of Dutch artist Theo Jansen’s Strandbeest kinetic sculpture creations walking around. Known as the Gilded Lady, this mummy’s headdress is made of cartonage (glued layers of papyrus or linen) and covered with gilding. Ancient Egyptians believed that masks allowed the dead to maintain their senses in the afterlife; the golden skin was used to show divinity. For more than 100 years, the Science Museum of Minnesota has offered fun and educational exhibits for all ages. You won’t miss a taste of any of them when you follow the museum’s Instagram feed. Even past exhibits, like Mummies and Jerusalem, are available for your perusal online. Today's #ScienceQuoteSunday celebrates Barbara McClintock, an American scientist who was awarded the 1983 Nobel Prize in Physiology or Medicine for her discovery of genetic transposition! Boston's Museum of Science is one of the premier American museums promoting science and technology. In addition to public exhibitions, the museum offers educational programs and teacher resources, traveling exhibits, private events, overnight field trips, and awards and recognition for those who contribute to the fields of science and technology. Every Sunday, the museum’s Instagram feed features a different scientist with an inspirational quote for #ScienceQuoteSunday, with an emphasis on women in STEM fields. In between, there’s plenty of science to learn and exhibits to see. 5. NATIONAL AIR AND SPACE MUSEUM // WASHINGTON, D.C. The National Air and Space Museum in Washington, D.C., is part of the Smithsonian Institution. For the rest of this year, it’s a pilgrimage site for Star Trek fans as they celebrate the 50th anniversary of the original series. 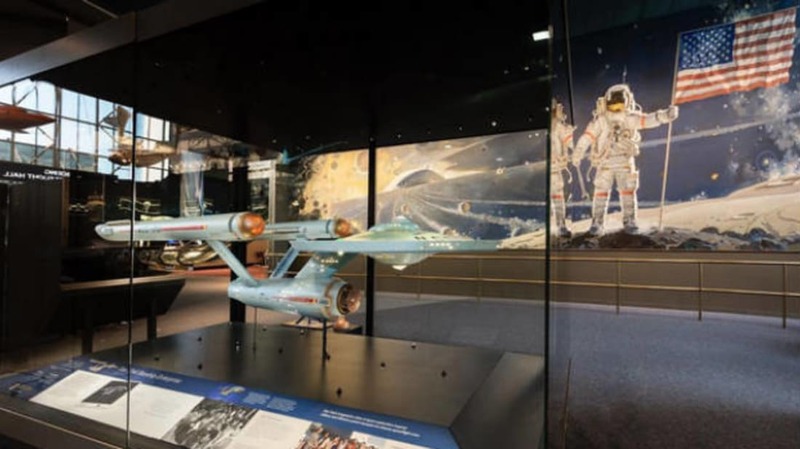 The flagship exhibition, so to speak, is the newly-restored original TV model of the starship Enterprise. You can see the process of the model’s restoration and keep abreast of Star Trek events on Instagram. The Mütter Museum asks, “Are you ready to be disturbingly informed?” The Philadelphia institution houses tributes to the strange and often overlooked parts of the history of biology and medical science, which means their exhibits are often morbid. But it's also a treasure trove of things you won’t find in other museums. The museum’s Instagram account offers a look at exhibitions like the permanent Hyrtl Skull Collection, which inspired photographer David Orr’s "Perfect Vessels" series, on exhibit now at the Mütter. (The picture above was taken while Orr was photographing the museum’s skulls for his project.) Each photo in the Mütter's feed comes with a fascinating history, such as the skull that shows evidence of a lobotomy. A Samba drumming team is outside welcoming guests as they arrive for our Members Party tonight! Can you hear them, #DTSJ? The Tech Museum of Innovation is appropriately located in the midst of California's Silicon Valley. It is a family-friendly museum that is open to the public, but also supports education by offering field trips, professional development for teachers, and lesson plans. These public programs are celebrated on the Tech’s Instagram account. The Tech is currently preparing for its Tech Awards gala, which is slated for November 17. The awards are presented to people who use technology to solve some of the world’s greatest challenges; the museum’s other Instagrams—@TheTechChallenge and @TheTechAwards—follow the previous winners, potential winners, and updates as the awards draw near.